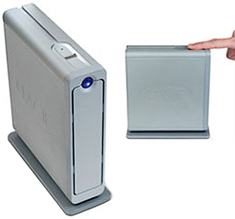 LaCie d2 SAFE Hard Drive | OhGizmo! As part of my ‘other’ job I deal with a lot of footage, images and project files that eat up quite a bit of hard drive space. As a result I have an ever-growing collection of external hard drives and while I normally prefer to build my own which is usually the most cost-effective solution I do have one LaCie. In fact it serves as my primary day-to-day backup drive and besides being quite reliable and running fairly cool my LaCie just plain looks cool sitting on my desk. For those who are particularly worried about their data falling into the wrong hands LaCie is introducing the d2 SAFE external hard drive with a built-in biometric fingerprint scanner. Now LaCie already sells a portable hard drive with the biometric option (I wrote about it here) but this is their first desktop model with the added security feature. The drive itself holds 500Gb and stores 5 unique security profiles for different users which is probably quite handy in an office environment. The SAFE is also PC and Mac friendly and has connections for FireWire 800, 400 and USB 2.0. The LaCie SAFE will ship sometime this month and is available for pre-order on the LaCie website for $299.99. I have a pair of dead Lacie externals on my desk right now, and one of them is a 500gig Big Disk Extreme. I hadn’t considered that the drive might have have two 250gigs inside when I bought the Big Disk. Their striping method led to unrecoverable data loss when one of the two drives failed, and I won’t ever buy another LaCie product.